What’s one of the main reasons that you would use a cupronickel heater? The cupronickel heat exchanger is a little bit tougher against corrosion and erosion that may come from the chemicals or debris. Basically, if you have problems with high TDS (Total Dissolved Solids) or if you have a pool that is out of whack chemistry-wise, a cupronickel heat exchanger will be more resistant to that type of erosion or corrosion to the actual heat exchanger itself. It makes the heater last a little bit longer. Where we see this a lot is up around the Great Lakes area, the water is a little bit harder up there, or in areas like in the desert where water is a little bit harder. Cupronickel seems to last just a little bit longer because it’s tougher material. So it’s not just for saltwater applications? That’s correct. Basically, what we look at is the TDS, the Total Dissolved Solids, and if it’s a very high TDS environment with the salt system, or with hard water or something along those lines. We generally recommend the cupronickel heat exchanger. What exactly is a Low NOx? Does it mean low emissions? It’s a lower percentage of particulates that are emitted when the heater is operating. Now there are only two areas in the country right now that actually have laws or regulations concerning emissions coming from pool heaters. A pool heater generally is a very low emission compared to a boiler or a gas furnace. Low NOx complies with air quality regulations in Southern California and Central Valley of California as well as in Texas. There were certain counties in California where Low NOx is required, so you have to check your local air quality regulations for confirmation. In Texas, on all commercial installations, you need to have low NOx. We make a special type of heater just for that application. Is it possible to Oversize a heater too much? We say no. You can never oversize because nobody ever got upset that their pool heated up too quickly. We recommend slightly oversizing a heater so as the unit ages and becomes less efficient, especially if not maintained correctly, the pool is guaranteed to be heated with an adequate BTU and in a less costly manner. Raypak Heater and Heat Pump sizing calculator. Does oversizing the heater, save on gas? 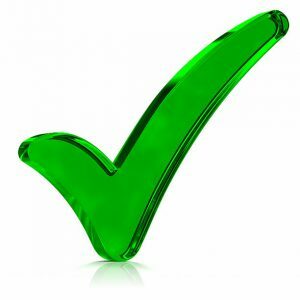 You’re going to need to consume a certain amount of gas to get the water temperature up to a certain area. So the bigger the heater you have, the less time it’s operating, the less noise that it makes, the less electricity that you’re using; it’s just more efficient to do that. How do you know how to size a spa heater? It’s hard to generalize, and we do have a sizing chart on our website that anybody can access. What we like to do is take into account, is it in the sun all the time? Or is it in shade? Is there a cover on the pool? Is it uncovered? Wind always is a factor, especially in coastal areas because you constantly have wind coming in from the water. Generally, we like to size the heater. Like I said, slightly oversized or larger is better. But if we want to keep it in a cartain range, we like to slightly oversize it mainly because of these other factors. If it’s particularly windy on a certain day, that will cause your pool lose heat a lot faster. Generally, we like to size them a little bit larger even on the small heaters, even with small pools or spas. 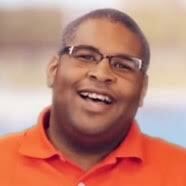 Does Raypak honor the warranty if the homeowner buys from Inyo Pools? Yes and actually Inyo is one of the companies that we actually recommend people go to. You guys know pools and you know how to correctly size the heater, as well as tell the consumer how to install the heater, how to operate and how to maintain the heater going forward. 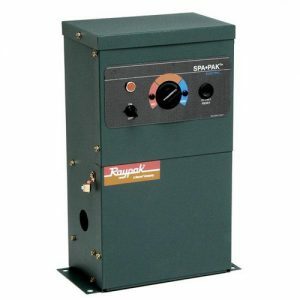 We recommend buying from people that know how the Raypak heater operates. The warranty is in effect, there are no issues there. As long as they’re properly installed to our recommendation and they’re maintained correctly. 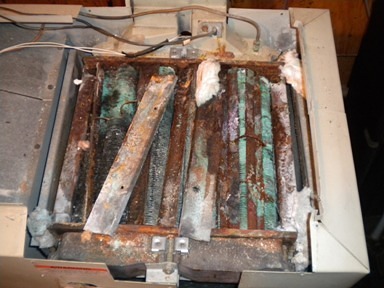 We have a lot of warranty claimsbecause of chemical damage to the heaters. And the chemistry of the pool is typically where we have the most issues. If you maintain the pool correctly, and Inyo does a great job of you know telling the customers how to maintain their pools, the heater will last a long time. But if a pool is not maintained correctly, the heater is one of the first components that will go bad. Because the heat exchangers are copper, and copper is a very soft material. If there’s any chemistry imbalance or high TDS, even a cupronickel heat exchanger won’t last forever. Even a titanium heat exchanger won’t last forever. Like in our heat pumps, you have to maintain your chemistry and the materials that are in your pool water. Otherwise, it’s not going to last as long. Is the most important thing in maintaining a heater, water chemistry? The most important things are water chemistry and making sure that the equipment is installed correctly. Because even with salt systems and especially the salt systems, if the salt system and the heater are not installed correctly and properly bonded, then you have what is called electrolysis, and that’s almost as dangerous as bad chemistry and high TDS. 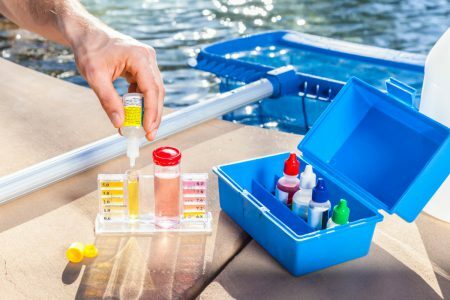 You’ll start to see that on other parts of your pool, for instance like your ladders, or your lights or anything that has anything metal associated with it, if it’s exposed to that water it will start corroding as well. Your heater just happens to be one of the first things to go because a lot of water is flowing through it very quickly. Are heat pumps suitable for the cooler states in the Northeast? A heat pump will just take the edge off the seasons. They can start heating their pool in early May and they can continue heating it through September maybe into early October. They’re not looking at heating the pool the whole year round. They have low electrical costs and they have the ability to heat their pool in the timeframes that they want to do it. So a heat pump actually works very, very well for them. Raypak’s new heat pump platform are larger, have higher BTU outputs, much more efficient, and quieter than our previous platforms as well. Our heat pumps actually are a great value for areas that have lower electrical costs, especially with gas prices being what they are lately. And heat pump sizing follows the same principles as gas heaters? The bigger the better is what we recommend mainly because it’s a slower heating process. A heat pump is much more efficient than a gas heater, but it heats the water slower. Our largest heat pump, for instance, is 140,000 BTUs which is actually smaller than our smallest residential sized gas heater. The reason for this is a heat pump will gradually bring the pool up to temperature but once it’s up to temperature, it maintains it- – more economically. For instance, a heat pump could be as much as 5 to 600% efficient whereas a gas heater is 82 to 84% efficient. It’s not a perpetual motion machine it’s just for the amount of money that you spend to put energy into the unit, it gives you that much more energy into the water than what you pay for. Plus, the heat pumps come with the titanium heat exchanger which is better than the Cupro-nickel. But it’s not impenetrable, it can be damaged if you really have bad chemistry but it does take a lot more. Heat pumps are more expensive than gas heaters. Their heat exchanges are a smaller diameter tube, that’s why you have to have the water flowing through slower and it doesn’t transfer as much heat as say a gas heater would. We really appreciate Raypak’s relationship with Inyo because we know how good your product is and its the pedigree. Thank you for joining us. You didn’t mention solar heating. We had our system installed right after our salt pool in 2004. At the time I thought it was very expensive, but now looking back, it seems much more economical than a heat pump. We live in central Florida and our pool is only 11,000 gallons, but we usually swim from April through October. Hello Terry, we did not cover solar because Raypak does not make solar pool heaters. As technology improves solar should become less expensive. But living in Central Florida is going to be a big difference than pools in Ohio, Colorado, and Washington. And if you want instant heat for a hot tub, or a constant rate of rise then a solar heater is not ideal.